Media Alert: Sunday, February 21 2016. Preview Highlights Video of the 2016 RORC Caribbean 600; Interviews, atmosphere and on board footage prior to the Antigua start on Monday, February 22. With 70 yachts participating, including some of the world's best known racing teams, the 8th edition of the race is about to get underway. Interviews, preparation and training action from Antigua. 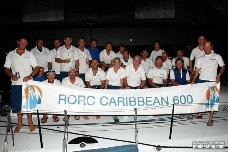 A record fleet of 70 yachts will be competing in the 8th edition of the RORC Caribbean 600 starting from Antigua on Monday 22 February. This year's race will see the most spectacular line-up of high performance boats racing anywhere in the world. The crew list reads like the 'Who's Who' of elite international sailors with hundreds of round the world, Olympic and Volvo Ocean Race professionals rubbing shoulders with passionate corinthian sailors on the same 600 nmile race course around 11 Caribbean islands. Interviews with organisers and crews, pre-start party atmosphere and on board training footage with some of the owners and crews as they prepare for this epic race. Keep up to date with all the news. There will be blogs from the boats themselves on the race course, images, video and daily race reports. Follow the action as it unfolds on the RORC Caribbean 600 website.